I was working on a Spring School Conference and workshop last week with two colleagues, Victoria Caldy of My Marketing Team and Joanne Taaffe, an independent journalist, with 80 International Students around the theme of “Create the Future”. The key idea was to take an existing SME and create future products or services for its brand, using current trends. I use a variety of web-sites for tracking trends but I find trendwatching one of the best. We gave the students 4 trends, one of which was R.A.K. Random Acts of Kindness. R.A.K. is an interesting one, as it has its roots in the financial crisis we have been experiencing over the last 2 years. I think it’s going to be BIG. So let me tell you a little about it. It’s really for consumers, who are fed up and annoyed by distant, inflexible and self-serving corporations.For brands, it’s increasingly about open communications both with and between consumers (especially online). What does this mean? This means that the more you know your customer, the more you will know how to please them, surprise and delight them with R.A.K. : whether that’s sending them a gift, responding to their publicly expressed moods quickly and appropriately or just showing that you care. R.A.K. appeals to the vast (and ever-growing) number of consumers who make up GENERATION G (that’s G for Generosity not Greed). Increasingly expect businesses to be socially, ethically and environmentally responsible. The Human Touch. Consumers increasingly want to see the human side of brands (or if indeed a brand has a human side at all ;-), making R.A.K. more welcome than ever. R.A.K. are just a fun and light-hearted demonstration of how brands can access some of this publicly available information to brighten consumers’ days. contacted and sent a bouquet of ﬂowers as a surprise. Washington-based eco-conscious restaurant chain Sweetgreen employs a street team to perform « random Acts of Sweetness » for its customers. Previous acts include covering people’s bike seats when it rains, or leaving gift certificates for drivers who’ve received parking tickets. 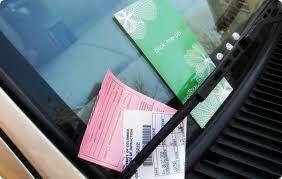 Got a Parking Ticket? Don’t worry Sweetgreen will make it feel better with a R.A.K. So, do you know any brands who are kind or human, or both. If so, take a look closely at how they do it. Think about how your brand can be more human to your customers. Créativité Consultants, Where Creativity Comes from the Heart. The Napkin Project – what’s your story?